SOFA so good for the innovative partnership between one of the UK’s top furniture makers and a leading college. Coleg Cambria has supplied Westbridge Furniture with six apprentices since joining forces with the Deeside-based company and is encouraging more youngsters aged 16-18 to enrol on their popular traineeship scheme before moving on to a full apprenticeship. In collaboration with North Lancs Training Group, the Level 2 Upholstery Apprenticeship programme runs for two years. Participants are given the opportunity to put the finishing touches to chairs, sofas and beds for global customers including IKEA, M&S and John Lewis. Learners spend up to eight weeks at Cambria’s Deeside site as part of the traineeship scheme, where they are taught basic employability skills such as time-keeping, teamwork and health and safety. The following four weeks are spent on work placement at Westbridge. As an active member of the production team, participants will gain first-hand experience of the sector and company values, after which, if successful, they will be invited to begin the two-year apprenticeship programme. Nicola Gaughran, Operations Manager for Traineeships at Coleg Cambria, said the project has been a resounding success and an attractive proposition for teenagers wanting to pursue a practical career. And it comes as the college celebrates the best work-based learning (WBL) inspection in Wales to date from Estyn, the education and training inspectorate. “To be able to run this programme with such a reputable, growing company is fantastic for the learners, it’s a win-win situation,” said Mrs Gaughran. “The vast majority of those who joined the scheme recognised what an incredible opportunity this is, and the apprenticeship scheme pays way above minimum wage. 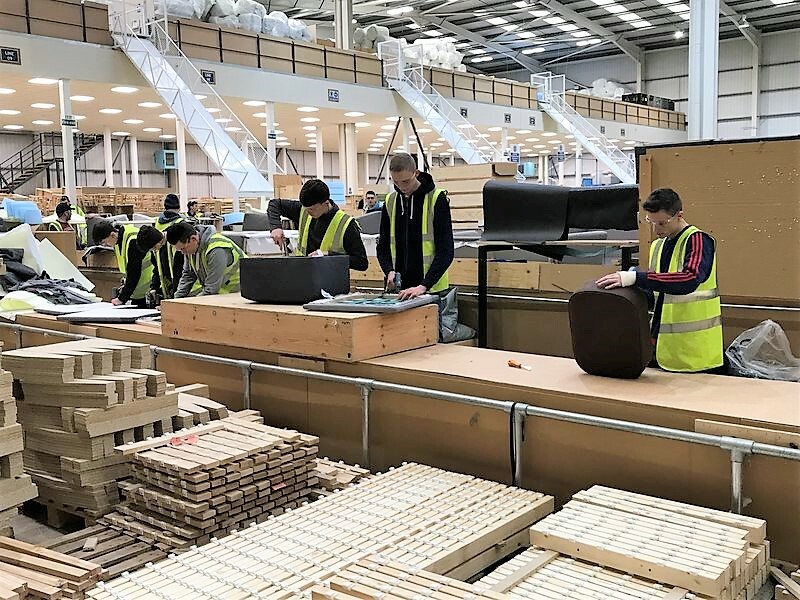 Westbridge Furniture operates out of three UK production sites, including Deeside and Holywell, employing over 1300 people in the UK. The firm manufactures in excess of 10,000 pieces of upholstery per week, with an annual turnover of more than £90m. HR Manager Nick Arundell says there is demand for more production workers – particularly in upholstery – and is delighted to have already recruited trainees from the college. He added: “We have four apprentices who were part of the launch who are now past the halfway stage and doing very well. “They have grown as individuals as well as on the practical side, and within the first six months one of them was even going out to local schools to demonstrate upholstery to pupils and donated to them the furniture they made together. Mr Arundell added: “By the end of the programme they will be highly-skilled upholsterers with knowledge and a practical insight into the workings of our company. “As Westbridge Furniture continues to go from strength to strength, that’s exactly the kind of staff we need. For more on the range of traineeships, apprenticeships and courses at Coleg Cambria, visit www.cambria.ac.uk or email traineeships@cambria.ac.uk. Visit www.westbridgefurniture.com for more on Westbridge Furniture.